Yesterday was my parent’s 60th Wedding Anniversary. They were married right after Dad returned from his Navy service right after WWII. I was born less than a year later in July. They met in college and had a small ceremony in the living room of my Grandparent’s house. Iwasn’t there. I have seen pictures. My Dad was in the seminary and became the fifth generation minister. None of his five kids followed that path. The fact that I was born right after WWII makes me a Post War Baby Boomer. I have always thought that was cool. My generation has been a big huge bump traveling through time. There were so many of us born after WWII that we have always had a huge influence on the economy and trends from the time we were born. Schools had to be built, dorms had to be built, and all sorts of changes had to be made to accommodate this huge number of people. Many of our men were killed during the Vietnam War, which had a huge effect on our politics and our transition to adulthood. I have several theories about the effects of Vietnam, one being that the trend for women to have kids on their own as single women had to do with the loss of so many men to that War. I also believe that the divorce rate is partially due to the effects of Vietnam on the men who served. Many were so damaged that if they survived that War and returned home, they had problems with family life and with relationships. I believe this effect was the same for those who served in the military and for those who did not. This is bringing tears to my eyes as I type as the memories of the struggles at the time can still get to me. I know many men who served and came home with lasting effects. I know just as many who didn’t go due to their own personal decision about what they thought was right, and what they went through was very hard on them as well. It is not for me to say which was hardest or worse. I can only tell you that I know no one who was not supportive of those who made their best decision at the time. What I mean by this is that I know no one who was negative about or not supportive of returning Veteran of the Vietnam War. The whole idea of the Hippies protesting as soldiers returned was not something that I saw ever. The people that I knew welcomed those who served home and surrounded them with love and support. I have no idea where the reactions that are remembered about the return of the soldiers actually happened. I think that it was people who were come in to the antiwar movement late in the war who really didn’t get the reasons why many of us opposed it, but they knew they should be against it, so they took it out on the later returning troops. I just can’t stand the idea of that. I could never be that way toward anyone in the military. It makes me sad to think of anyone being treated with less than thanks or respect as they did what they thought was right, and I feel that even if I was against the War, I was not against anyone who thought the right thing to do was be there. Wow, those are some of my strong feelings! Anyway, I wish to honor my Mom and Dad, Edward and Nancy DeChant, who are still doing well at 84 years old. They are enjoying a trip to a Model Railroad Convention in Colorado. 60 years is a wonderful milestone. I love them so much and feel that the contribution they have made to their children and to the world is noteworthy! Dad was a minister and Mom was a Kindergarten Teacher, and they both touched many lives. Even as retired people, living in Arkansas, they contribute to their community of Jasper to as very committed degree. To make this Aussie related…2006 is my 30th year as an ASCA Member and as an Aussie owner. So it’s my 30th anniversary of one of my most favorite and meaningful affiliations! 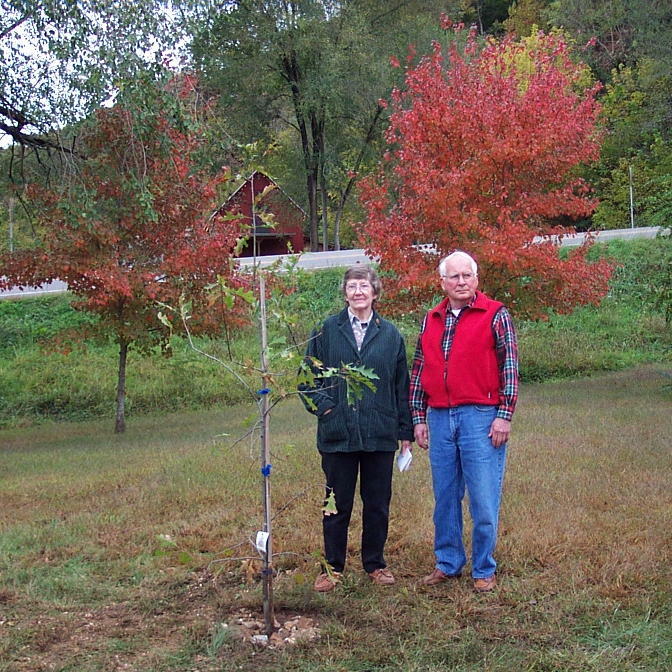 Happy 60th Anniversary to Mom and Dad, and Happy Anniversary to Ann DeChant and Gene Stephenson for the beginnings of Sundew Australian Shepherds! This entry was posted on August 27, 2006 at 10:26 pm and is filed under 1. You can follow any responses to this entry through the RSS 2.0 feed. You can leave a response, or trackback from your own site. What wonderful sentiments your expressed about your parents. You can tell you truly have a lot of respect and love for them. My parents will be married 38 years later on the 20th of this month! I feel their marriage showed me and my siblings what a loving relationship is and how important communication is. My husband and I just celebrated our 16th wedding anniversary and even though it hasn’t always been an easy path, working through our differences of opinion, learning how to “fight” and raising three children has helped us to build a strong and beautiful relationship. Happy Anniversary to you and Scott. You deserve every happiness! Happy Anniversary to you Mom and Dad, too! How wonderful! Wonderful sentiments about Mom & Dad big sister! I too am amazed at how many people they have touched in their long and happy lives. I also share a lot of your feelings on the Vietnam War. I remember a parade many years ago. There were a few Vietnam Vets marching and it brought tears to my eyes because many were treated with little respect when they came home. I hooted and hollered and let them know that I appreciated what they had done. Thanks for sharing your feelings Ann. Cool Blog! I really enjoyed your recollections of the anti war movement of the sixties. That is what I remember too. Your writing brought tears to my eyes also….” those who do not remember history are doomed to repeat it “.